The Bolshoi Simulation is a massive, incredibly detailed model of everything, providing a comprehensive simulation of the universe's 14 billion year history. Scientists are now exploring the simulation, and we've got some of the most breathtaking results of their efforts. The image up top is just one many stunning images to come out of this new simulation. This particular image shows how gas is distributed in the universe's most massive cluster of galaxies, which is called Cluster 001. Scientists are using this new simulation to create stunning images and video that help reveal many of the universe's most complex mysteries...and help us remember how beautiful the cosmos really is. The Bolshoi supercomputers create this simulation of the large-scale structure of the universe by first examining the data from NASA's WMAP explorer, which maps out the cosmic microwave background radiation. Since this radiation is the light left over from the Big Bang, it's the most ancient data in the universe, and from those starting conditions the supercomputer can use existing theoretical knowledge to simulate the evolution of different parts of the universe. Because the supercomputer's results match up almost perfectly with what we actually can observe of the history of the cosmos, astronomers are confident in its accuracy as a proxy for the actual universe. Dark matter is a key part of the simulation - it would have to be, considering it accounts for 25% of everything in the universe and about 80% of all matter. 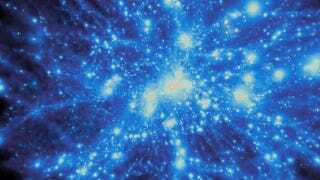 The simulation relies on a theoretical model known as the Lambda Cold Dark Matter model, which says that gravity began pulling bits of dark matter together into clumps shortly after the Big Bang. These clumps became larger and larger over time, attracting regular matter to form galaxies around them. Even though we still don't know exactly what dark matter is, it is the primary driver of the evolution of the cosmic structure. The Bolshoi supercomputers simulated one representative section of the universe, measuring one billion cubic light-years - by comparison, the Milky Way is only about 100,000 light-years long, and our galactic cluster, the predictably named Local Group, is still just 10 million light-years in diameter. The simulation covered a massive chunk of the universe, and it simulated the interactions of 8.6 billion dark matter particles. That task took one of the world's faster supercomputers over six million CPU-hours to complete. The results were more than worth all that effort, as you can see from some of the awesome videos below. Starting from the relatively smooth dark matter distribution of the early universe discerned from the microwave background and other large sky data sets, the Bolshoi tracked the universe's evolution to the present epoch shown above, given the standard concordance cosmology. The bright spots in the above video are all knots of normally invisible dark matter, many of which contain normal galaxies. Long filaments and clusters of galaxies, all gravitationally dominated by dark matter, become evident. This video also features accompanying music, "Her Knees Deep in My Mind" by Ray Lynch. This next video gives some idea of how well the Bolshoi simulation matches the observed universe. The video compares data from the supercomputer with the distribution of galaxies observed in the Sloan Digital Sky Survey, or SDSS. What's particularly cool is that, while the real observations and the simulated data match, the information from the supercomputer also includes dark matter halos that we can't detect directly. This suggests the dark matter model is a good fit for explaining the evolution of the universe. It's not proof of dark matter, but it's a cool indication that we're probably on the right track. This video examines whether our galaxy is somehow unusual. Based on both the SDSS and the Bolshoi simulation, it does appear the Milky Way is somewhat unique, at least in terms of the company it keeps. The Milky Way has two satellite galaxies known as the Magellanic Clouds. It turns out that only about 5% of galaxies like ours have two satellites galaxies, meaning we fall into a fairly small minority. Speaking of the Magellanic Clouds, this next video uses the Bolshoi simulation to determine how the Milky Way and its galactic neighbors might have formed. Using all the available data on how dark matter halos work, this video presents one possible scenario for the evolution of our galactic neighborhood. Among other things, the video reveals that the Magellanic Clouds may only have shown up recently, cosmically speaking. Finally, if you've got an extra half-hour to spare and you really want to dive in deeper with all this, check out this lecture by Joel Primack at the 2011 Santa Cruz Galaxy Workshop, in which he explains how the entire simulation works. For more information, check out the Bolshoi Cosmological Simulations website. For an overview of related academic papers, go here. Additional videos here and additional images here. Top image by Kristin Riebe, PMviewe. Videos provided by Risa Wechsler.